On a peninsula that juts out into the Crescent Bay stands the northernmost member of the Confederacy of Nine Cities, Azūl, the City of Death. Steeped in dark tales, Azūl is a place few dare seek out let alone explore and earned its sinister reputation from its founder, the Witch-King Ashrakal, and from the Black Hand, an insidious guild of assassins who ascended to power in the city by bending the decadent and corrupt Guild Council to their will. Now, Azūl’s people live in terror of the assassins, who have infiltrated every level of society, their blades sharp and smeared with poison to dispatch anyone they deem traitor to the Mistress who rules. In this entry in the Lands in Shadow series, City of Death examines one of the most sinister and frightening members of the Confederacy of Nine Cities. As with other installments, the information presented should serve as a starting point for bringing the city to life in your game. The details provided about the city and its inhabitants serve to spark your imagination for further developing the city to your liking. You should change anything you need to make this city yours. 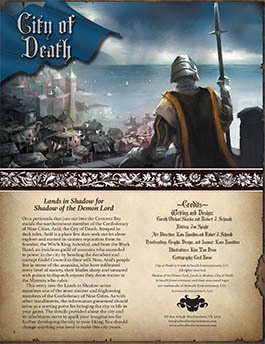 Buy City of Death in PDF from Schwalb Entertainment or DriveThruRPG today!